This post is based on a document from the war diary appendices to Panzergruppe War Diary August to November 1941, the section dealing with the planning for the attack on Tobruk. See also this older post. 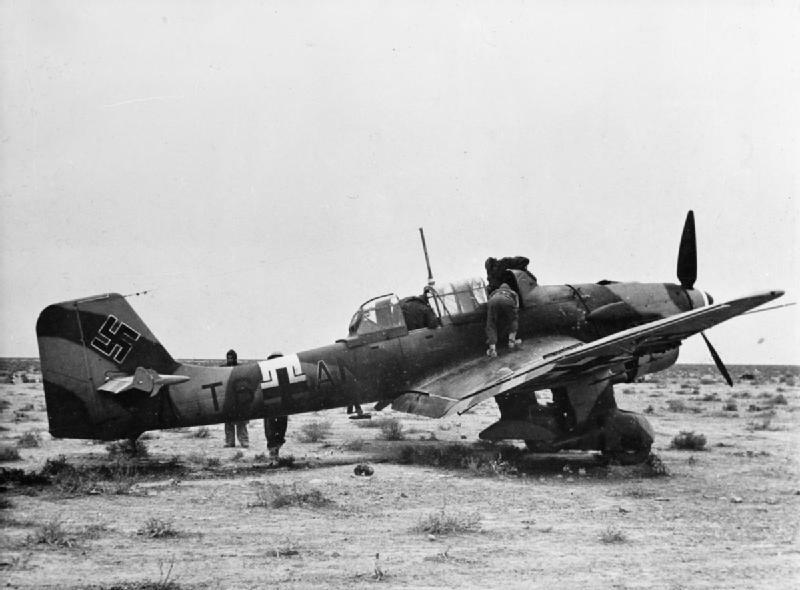 Prior to the attack it was planned to substantially reinforce the strike force of the Luftwaffe in North Africa, by temporarily basing medium bombers and Stuka ground attack planes there. These planes were to come from the Greek mainland and Crete, while planes from the Greek mainland would also operate utilising Crete as a forward base. Planes were also to be moved from further west to Gambut and Gasr el Arid, very close to the planned breakthrough sector. Based on this document, there would not have been a joint command arrangement governing the Luftwaffe and the Regia Aeronautica missions, which would further have complicated command arrangements, since Fliegerfuehrer Afrika was not under command of Panzergruppe, but rather only auf Zusammenarbeit angewiesen – instructed to co-operate. Fliegerfuehrer planned however to install a close combat command at Gambut airfield. The purpose was presumably to ensure close co-operation between the dive bombers and the ground forces. What is interesting about the numbers is that these do not contain the totality of the planes based in Sector East for the Italians. Furthermore, they are maximum numbers, not taking into account likely serviceability rates, which ranged from ‘okay’ for the single-engined planes to dismal for the Ju 88. Unit designations based on Montanari, and are only a guesstimate. 2./(H)14 = 2nd Squadron Army Reconnaissance Group 14 (a close reconnaissance and ground support unit equipped with Hs 126 recce and Me 110 ground attack/fighter planes. See these two older posts for Regia Aeronautica plane types (fighters – bombers). The table below gives some information on how the German navy equipped merchants on the North Africa run with AA capability, in order to protect them from the roving Blenheims and Swordfish or Albacores operating from Malta. The memo of which the table was part was sent on 26 November 1941. Of note that three of the vessels in the memo had been sunk by then, two of them with all hands, including the AA crews. Also of note that army (Heer) AA guns were shipped in a few cases, in particular on high-value merchants such as Ankara and Monginevro. Why they were put on the old and rather small steamer Procida is a mystery to me though. In any case, I hope this is of interest to some, and I would be interested to see how this compared to e.g. the armament on British merchants. No Naval AA Crews, Italian vessel which was being loaded with substantial German cargo at the time. C/30 = Standard 20mm light AA gun of the German navy, superseded by the C/38 20 mm gun which was copied from the German army 2cm Flak 38. C/38 = Standard 20mm light AA gun of the German army, adopted by the navy due to its higher reliability. A quadruple mount was available, but not in service with the German navy. C/13 = Naval version of the MG13 light machine gun, introduced in 1930, and superseded by the MG34. Calibre 7.9mm. C/34 = Naval version of the standard light machine gun of the early war years. High rate of fire. Calibre 7.9mm. One of the issues that is cropping up in researching Operation CRUSADER through contemporary documents is the question of whether or not air attack was successful in causing damage on the ground. There is no doubt that the respective air forces thought it was, and claimed so in their own documents and/or post-war histories (see e.g. the entry on air power in North Africa and my comment on the RAF history on the Thoughts on Military History blog). Nevertheless, it is questionable whether these rather biased judges were right. The only way me and Michele, whom I am collaborating with on the air aspect, can see to get at this is to try to link ground attack missions to entries in war diaries or first person accounts (where the former are not available) on their effect. This is painstaking work, and I am not sure we’ll get it done. Based on an initial review of the issue, and some early looks into the data, it appears that the research hypothesis would be ‘ground attack missions on mobile targets were rarely successful during Operation CRUSADER’, with success being defined as the mission causing significant damage levels or disorganisation in proportion to the air effort expended. So you would normally expect an attack by 35 Ju 87 Stukas to lead to more damage than a strafing raid by two Fiat CR.42. It’ll be interesting for us to see what we can come with in terms of data, and I am sure there’ll be some animated debate around it too, since it will challenge some widely held preconceptions. The information below is from Intel Summary No. 1 distributed to 15 Light Anti-Aircraft (LAA) Regiment R.A. in January 1942. It was based on the experience of 1st LAA Rgt. R.A. gained in support of 7 Support Group of 7 Armoured Division during Operation CRUSADER. Dive bombing (Stukas) on an average does practically no damage. Every effort should be made to educate gun detachments to this fact. They soon realize it after experience in action, but are apt to overestimate the potential of dive bombing before they have gained experience. Bombing of any sort can, in no way, be compared with shell fire from Field Guns and Tanks. Even concentrated fire of this nature causes remarkably small amount of damage, and this fact too should be given to gun detachments. Gun detachments which have experienced this nature of fire are completely derisive of bombing attacks. The text below is from the same intelligence summary, but based on the experience of 57 LAA Rgt. R.A., which served under 4 Indian Division during CRUSADER. During the whole of this period  the Regt. was actively engaged in its more natural pursuit of aerial targets and had duels with no less than 780 aircraft in 187 engagements. The heaviest raids were during the eight days 7 to 14 December when successive Stuka attacks were delivered on all divisional areas. The attacks were delivered mainly on MT concentrations and Divisional HQ was a particular objective of the Ju 87. One of the most notable features of these duels was the extreme respect with which the bomber treated “flak”, his approach being at greater heights and his dive shallower on each successive occasion. There can be no doubt that the Lt.AA completely spoilt his aim and helped to maintain the morale of the ground troops. The majority of this fire was outside normal Bofors range but it served its purpose. Eighteen enemy aircraft were destroyed by the Regt. during the period but unfortunately no Me 109F was placed in the bag as these fleet “birds” gave little opportunity for practice. The report was very kindly looked up and made available by Drew, who also provides this service to others interested in National Archives files, for what I think is a very reasonable fee. You can find out more about this and contact Drew at this link. While somewhat confusingly written, it appears clear to me that on the hierarchy of threats the dive bomber ranks last, while the others (field artillery and tanks) are also to be discounted. The loss figures, when looking into particular engagements also contained in the report, seem to bear that out. During this period the Axis air forces still occupied airfields at Tmimi, Martuba, and Gazala, just 50 or so miles or less from the frontline, enabling them to send rapid raids multiple times a day to keep the advancing Commonwealth forces in check, to help cover the retreat of the Axis ground forces from the siege of Tobruk. For example, on 8 December Fliegerfuehrer Afrika managed to get 144 missions into the air, not counting Italian missions. A ratio of 2.3% of planes ‘duelled’, or roughly one plane shot down in 10 engagements. This appears to be T6+AN of 5./StG2. You can see a colour drawing of the plane at this link.